In large bowl, mix shrimp and Sriracha sauce. In 10-inch nonstick skillet, heat 1 tablespoon of the sesame oil over medium heat. Add shrimp mixture in a single layer; cook 1 to 2 minutes, without moving. Turn shrimp; cook 1 to 2 minutes longer or until cooked through. Transfer to plate; cover with foil to keep warm. Carefully wipe out skillet. Add remaining tablespoon sesame oil to skillet. Add kimchi and green onion whites around outside of pan; add eggs to center of pan. Cook 30 seconds to 1 minute, until edges are set; pour soy sauce over eggs, and cover pan. Cook 3 to 4 minutes or until yolks are set and no longer runny. Divide rice between 2 bowls. 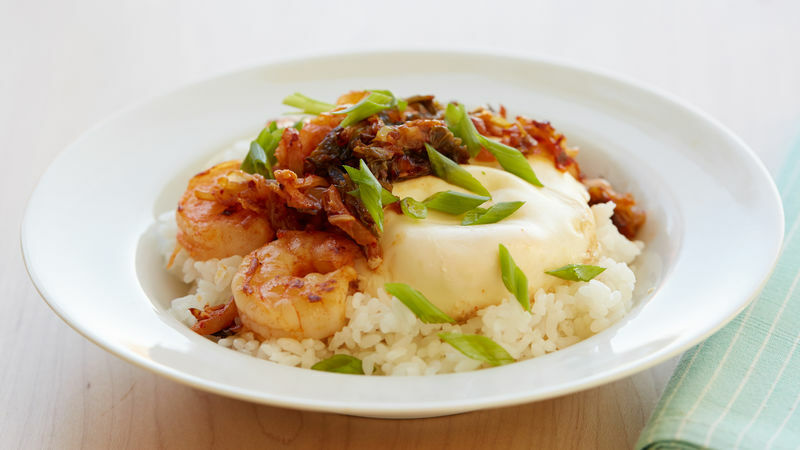 Divide shrimp evenly over rice. Top each bowl with 1 egg. Divide kimchi mixture and green onion greens evenly between bowls. Concerned about sodium? Substitute reduced-sodium soy sauce. “Faux frying” is a great way to get the feel of fried eggs without the mess and added fat.